The type Rhododendron formosum is a shrub or small tree with elliptic leaves, to 18cm, woolly beneath, and magenta-pink flowers with crimson spots and a basal blotch. The form Gibsonii has fragrant, white, pink-tinted flowers. To 5m. [RHSD, Hortus, Millais]. The variety gibsoni is naturally occurring. 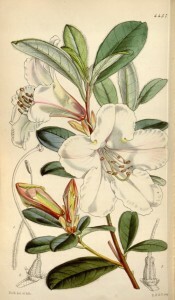 ‘Flowers [of Rhododendron Gibsonii are] large, whitish, tinted with pink, and spotted with yellowish brown on the lower part of the top segment.’ It was introduced in 1837 to Chatsworth by Mr. J. Gibson, who found it in the Khoseea Hills and was a popular greenhouse plant of the time. [MB p.217/1841]. ‘It was discovered by the late Mr. Smith so early as 1815, on the mountains bordering on Silhet in Eastern Himalaya. The flowers are very large and highly fragrant, and the habit of the plant is that of Rhododendron (or Azalea of most authors) ledifolium: but the leaves and the calyx are totally different. When brought to cultivation to the same degree of perfection as the plant just mentioned, it will be one of the most valuable shrubs for early forcing that can be conceived. Mr. Gibson, collector for His Grace the Duke of Devonshire, brought it from India some years ago, and it is probably one of the several species named but not described by Mr. Griffiths and detected by him in Eastern Himalaya. The flowers are a delectable white, tinged with yellow and rose, and have five external stripes of red.’ [BM t.4457/1849]. ‘We have a fine plant of R. Gibsoni, which measures seven feet from the pot and three feet through; this is, I should think, one of the most beautiful plants of the sort. The flowers are large and literally clothe the plant from the base to the top. I have had this Rhododendron in my possession for five years and would recommend everyone to grow it who cares anything about early spring flowering plants’. [Gard. Chron. 1856]. A plant of similar dimensions was reported growing at Kew by the Floricultural Cabinet. [FC p.129/1853]. FS p.47 vol.1/1845. Listed only in the 1850 catalogue. On 24th February 1849 Macarthur wrote to James Backhouse requesting ‘any good Rhododendrons. [ … ] the Nepal or Ceylon species would probably thrive here better than those from North America’. [MP A2933-1, p.189]. This is a possible source but it was certainly obtained from Veitch’s Nursery, brought out from England by Captain P. P. King in 1849. [ML A1980-3]. Believed by Macarthur to be a new introduction at that time. Azalea indica Sweet var. formosa, which may be synonymous with Rhododendron formosum Wall., was requested of Loddiges’ Nursery on 13th February 1848 [MP A2933-1, p.172]. Although not notated as died it was requested again on 1st February 1849 [MP A2933-1, p.185]. See also Azalea indica Sweet var. formosa.